If all my makeup got dumped into the ocean one day, and I were only allowed to choose just ONE item to save, it would be a really, really tough decision to make. But my choice is clear — Definitely the powder foundation! It was a struggle to decide which item is the most important to me: (concealer?? eyeliner?? liquid foundation?? ), but after some thought, one of the most essential functions of makeup, to me, is to give me that flawless, even complexion, and that is exactly what powder foundation can do for me, in just one easy step! And if a powder foundation promises to brighten, hydrate, mattify, and protect me from harmful UV rays all at the same time, I’m sold! 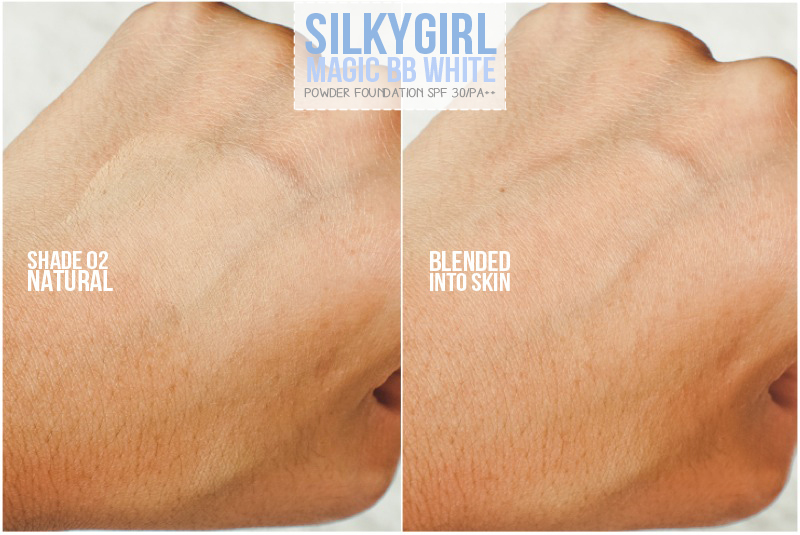 Which is exactly what the new SILKYGIRL Magic BB White Powder Foundation does! Here’s a look at the packaging: It is light, sleek and handy, perfect for carrying around with ease when you need to do touch-ups in the middle of the day! The slim SILKYGIRL Magic BB White Powder Foundation compact comes with a long mirror that’s easy to use, as well as its own sponge for easy application. Every compact comes with 8g of product. SILKYGIRL Magic BB White Powder Foundation’s main ingredient, β-White is an innovative ingredient that effectively brightens and lightens skin tone with continuous usage. Besides that, Silica absorbs sebum to ensure you have shine-free skin all day; Vitamin E keeps skin moist, soft and younger-looking; and SPF 30/PA++ protects from harmful UV rays. Meanwhile, Kernel Butter protects and repairs skin, and White Lily Extract provides moisturizing effects to the skin. 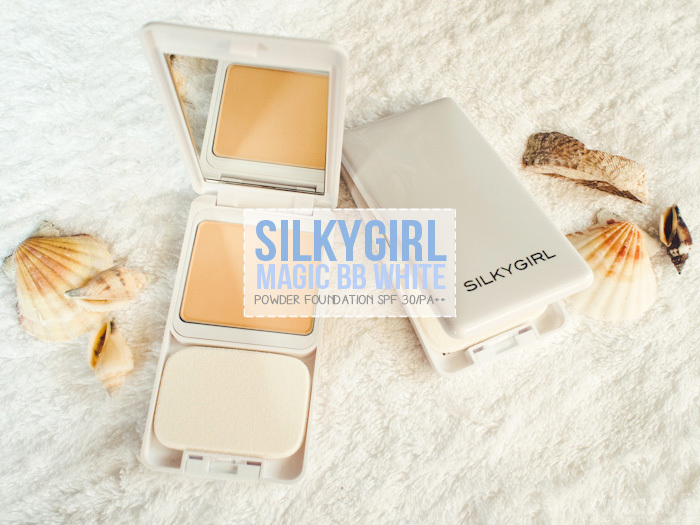 The SILKYGIRL Magic BB White Powder Foundation gives a natural and matte finish, is shine-free and fragrance free, and is formulated for Asian skin. SILKYGIRL Magic BB White Powder Foundation comes in four shades, thus it shouldn’t be too difficult to find a match! I swatched all four shades on the back of my hand, so that you can get a rough guide of what the shades look like! I’m definitely a 02 Natural, it matched my skin tone perfectly after I blended it in! You can see how silky fine the SILKYGIRL Magic BB White Powder Foundation is, it disappears into the skin upon application for a very natural, flawless appearance! You can see how my skin is instantly brightened, with less redness and shine to it! 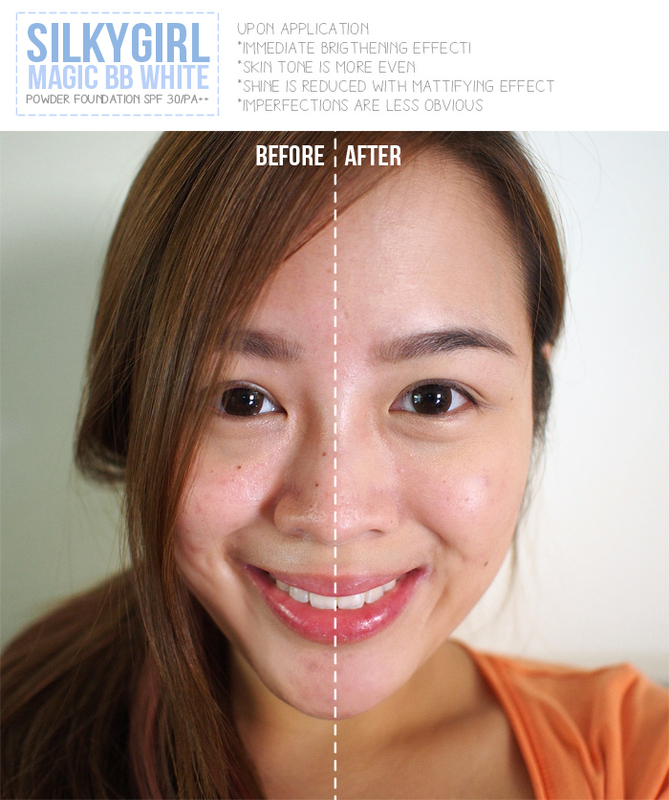 SILKYGIRL Magic BB White Powder Foundation also helped to mattify my skin and give it a more even tone. I was rather impressed at how natural it looked, while being able to conceal slight imperfections at the same time! The coverage is decent without being overly cakey at the same time. SILKYGIRL Magic BB White Powder Foundation is available for an affordable price of $14.90; with an introductory price of $11.90. It is available at major pharmacies, personal care and departmental stores nationwide. For the price, I think it is really worth a try, especially for the budget-conscious who prefers not to spend so much on make-up! This really does the job, no frills attached. A great functional and affordable product! SILKYGIRL is having a Facebook contest, with super attractive prices! !